Amber Holycross, Ciminelli Real Estate Corp.
Ciminelli Real Estate Corp. has received official notification from the USGBC that the 100,000 s/f Bethune Lofts project which was redeveloped to create 87 loft style apartments at 2917 Main St. has been awarded the LEED Silver rating for new construction. 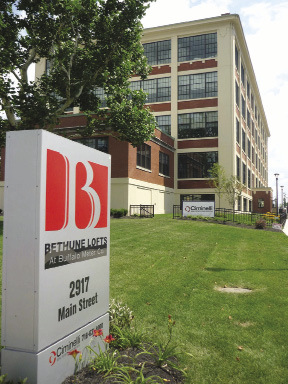 LEED Silver Certification of the building means Bethune Lofts is officially recognized by the USGBC as having achieved an exceptionally high standard of energy efficiency, while decreasing its overall impact on the environment. In preparing the submission to the USGBC, Ciminelli performed a detailed analysis of the site, design and construction of the building. Energy efficiency and water conservation in the operating and mechanical systems, connections to public transportation, coupled with use of recycled and regionally sourced building materials, were the building blocks of the successful certification. Amber Holycross, project manager for Ciminelli, stated "Our commitment to seek LEED certification from the early stages of the Bethune project and working from the ground up using LEED principles and practices allowed our team to achieve the high level of certification from the USGBC, LEED Silver." * Water efficient landscaping has been planted throughout the site, removing the need for an irrigation system. * A white membrane roof, reduces the heat-island effect. * Low-flow faucets, shower heads, and toilets reduce the amount of water used within the building by 33%. * The building incorporates energy efficient lighting, heating and cooling, which is 39% more efficient than a conventional building. * Energy Star rated appliances have been installed in all units. * During the construction of the building, 296 tons of construction debris was diverted from landfills.